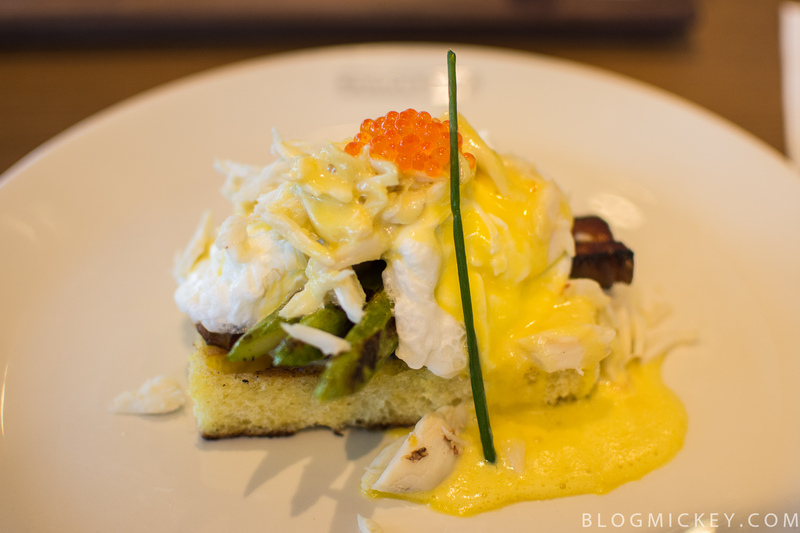 Paddlefish, formerly Fulton’s Crab House, is offering brunch on Sundays in addition to lunch, and we made it out yesterday to check it out. If you’d like a tour around the boat, check out our earlier post. This came in as our favorite of the dishes that we tried. Egg and crab sat on top of a layer of a grilled Nueske bacon slab. Slab is definitely the right word here as this bacon is closer to a strip steak than crispy bacon in look, consistency, and taste. The eggs came out perfect and the hollandaise sauce was rich. What fishiness there might have been in the taste of the crab, was hidden beneath the taste from the egg, bacon, and hollandaise. The challah base was a soft and spongy bread that provided a nice contrast to the more chewy bacon. I can definitely recommend this dish. 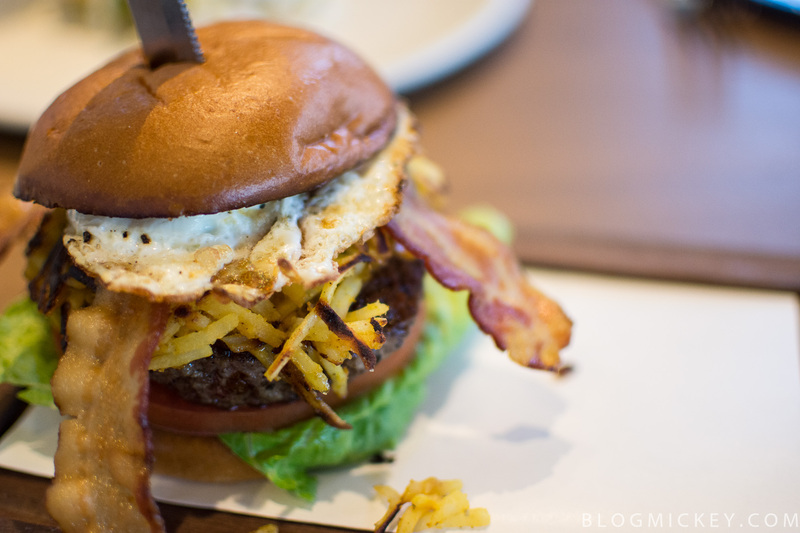 Coming in at our second favorite dish was the breakfast burger. This is a big burger. The patty itself had some wonderful flavor to it, but the rest of the ingredients listed above got lost in the shuffle. I did manage to identify some hash brown in a few of my bites, but most of the flavor came from the patty. 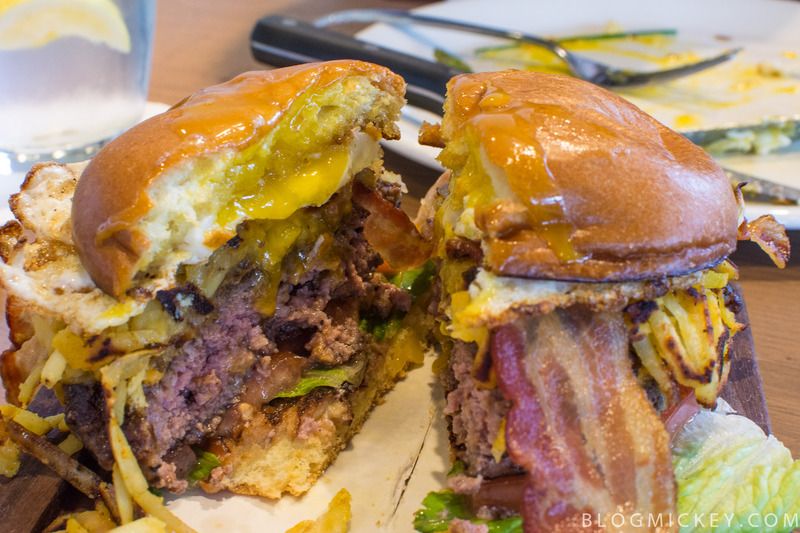 It’s also a messy burger. 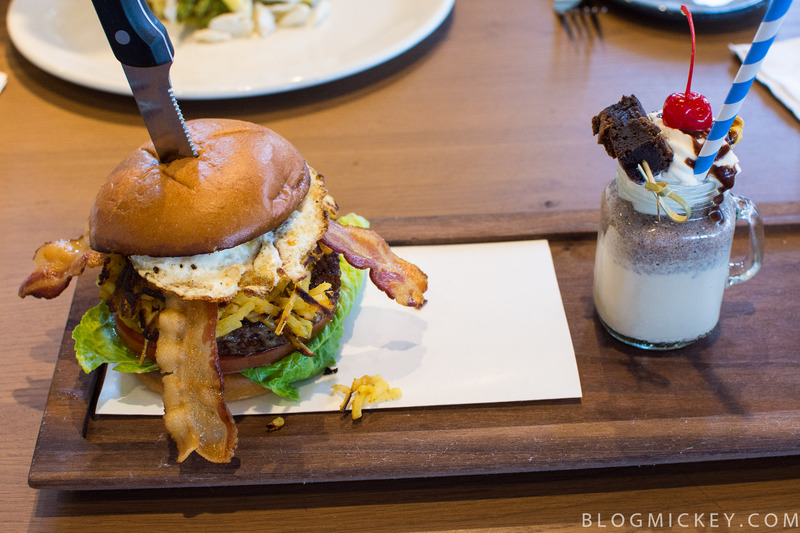 Served with a knife through the middle, the yolk of the egg starts to drench the burger the second you even wiggle the knife. Despite the lack of flavor from the ingredients, I think the burger itself is good enough to warrant a purchase if you’re looking for such a thing. It also came out with a mini version of their chocolate milkshake. 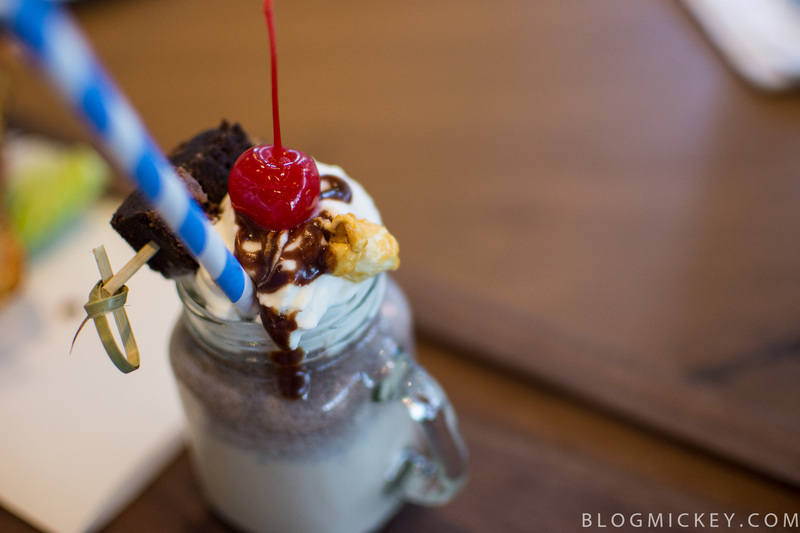 The shake itself was better than similar offerings at Planet Hollywood Observatory, and featured a warm brownie on top. I would suggest getting to the shake as early in your meal as possible, because it warms up quite quickly. The most disappointing of the plates was the New Orleans BBQ Shrimp. 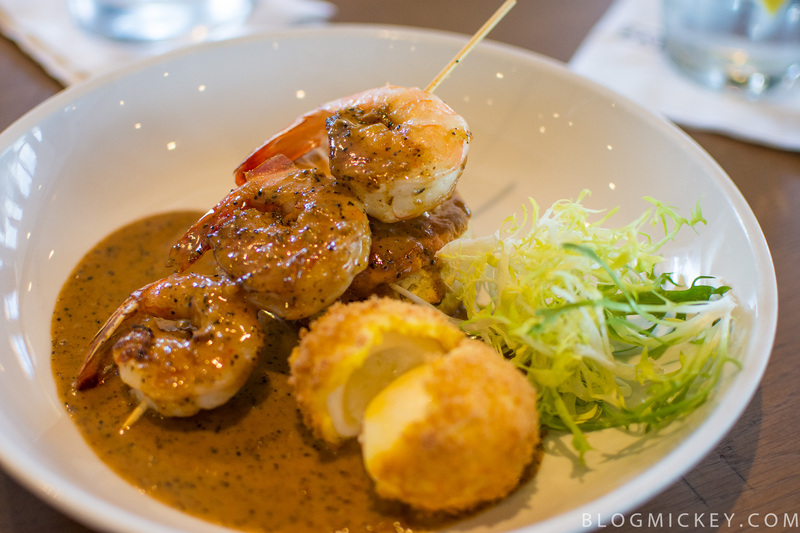 3 shrimp come out on a skewer sitting on a pool of BBQ sauce. The BBQ sauce itself was good. It was tangy with a kick of pepper and I used it for almost everything on the plate. There was nothing wrong with the shrimp except for the quantity. The dish broke down from there with the crispy egg and biscuit adding nothing in terms of flavor or enjoyment. The egg was bland and so was the coating. The biscuit was only saved by the fact that I had extra sauce on the plate after getting through my 3 shrimp pretty quickly. I would pass on this dish, despite the nice sauce. 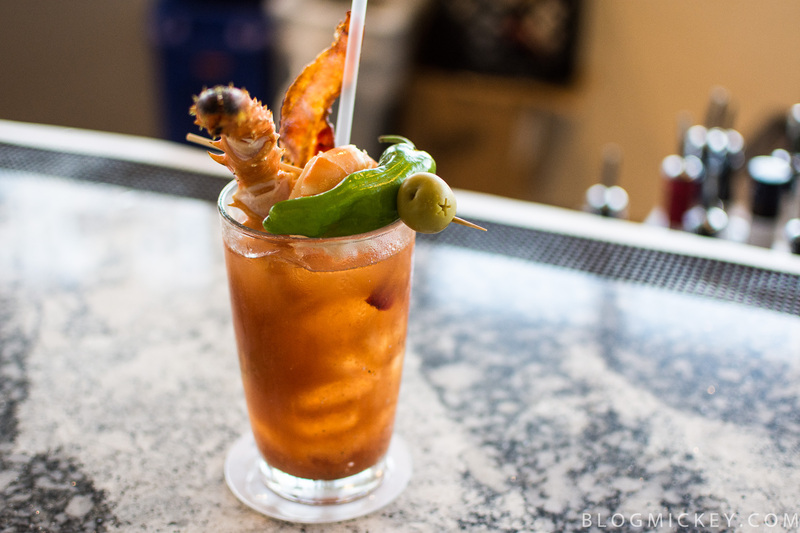 We don’t actually like Bloody Mary’s in general, but there was one out on display that looked exceptionally robust. While we didn’t order it, the bar staff was proud of it and wanted us to snap a picture. We love visiting Disney Springs in the morning before the hustle and bustle of the day, and brunch at Paddlefish will offer a nice relaxing start to your Sunday. We can recommend a few dishes and see some room for improvement in others. It’s worth noting that the brunch menu is served alongside the lunch menu, so you aren’t limited to just the few items listed. Brunch currently runs from opening at 11:30am through 3pm. 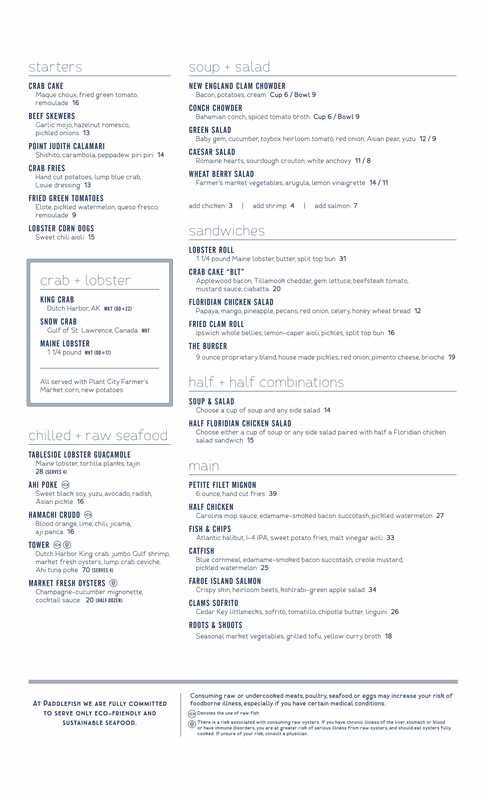 Here’s a look at the brunch and lunch menus.